The timing of Layden’s feat makes it all the more impressive, for at the moment longform is in danger of being suffocated by esteem. A new longform piece in 2013 signals not only a moral imperative for the reader to be duly impressed, but also a rare and precious opportunity for eager web developers to trick the thing out with every mouse-over gimmick that can possibly make your laptop slow down and wheeze. It is unclear whether the genre can survive either the moral imperative or the technological excess unscathed. Yet somehow Layden transcended his post-“Snow Fall” moment, a moment that, to be sure, is not entirely or perhaps even substantially the fault of “Snow Fall” itself. The aspiration is a laudable one, for “Snow Fall” is surely worth imitating. Its give-us-a-Pulitzer subtext was manifestly apparent in its very length and optional accessories (not to mention its url: nytimes.com/projects/2012). But swinging for the fences can, on rare occasions, produce a home run, and “Snow Fall” is certainly reason enough for a slow trot around the bases by Branch. A more traditional longform piece would have profiled just one of the survivors and chronicled their struggle to resume a normal life, but instead Branch and the Times’ coterie of web masters documented an entire harrowing event that was tightly compressed in time yet incredibly complex in space and impacts. Despite running some 18,000 words in length, “Snow Fall” is actually a near-frictionless read: I’ve now read it twice, and both times in one sitting. Branch achieved this quality by focusing with tenacious relentlessness on that particular day and on the 16 people who set out to ski the backcountry. Indeed, aside from a sentence or two on the configuration of the chair lifts at the Stevens Pass ski resort in the mid-20th century, armchair editors will search in vain for cuts to make. It’s all gold. That being said, the technology that could be deployed by 2012 truly made “Snow Fall” possible, in roughly the same way that Pixar movies only became possible in the last two decades. Without the Times’ detailed but lucid animations and graphics, there would have been no way to track 16 unfamiliar names in a locale that most of us have never before visited. In this instance, at least, the gimmicks worked in the service of the narrative, and, at the risk of belaboring the obvious, the stakes in this story were as high as they get. People lived or died according to the decisions they made that day. As such, “Snow Fall” is arguably closer in spirit to meticulous history of the wie es eigentlich gewesen variety than it is to longform’s more well-trodden paths. In particular, the helmet cameras worn by many of the survivors provided a documented record that is richer and far more accurate than what the participants would have ever been able to remember themselves. Where once there were footnotes there is now video. In the future not every momentous happening will take place in front of helmet cameras, but the ability to record high-quality video is growing ever more ubiquitous. And now that the “Snow Fall” template has been laid down, it seems likely that the next time — God forbid — there is a Titanic or a 9/11, this is how it will be definitively chronicled. The result will be “longform,” strictly speaking, but it won’t be something editors with “longform” in their job titles will be able to — or want to — whip up out of thin air the way you can a celebrity profile. Branch’s article reportedly attracted more than three million readers, and it’s no mistake that “Snow Fall”-indebted long form is already setting up the same instinctual response from the reading public that George Orwell felt when confronted in literature with what today we call NSFW language, namely, a churlish but circumstantially explicable determination not to be impressed. Just 11 months after “Snow Fall” was published, the formal web characteristics of the new genre have already calcified. When the scrolling motion on your track pad produces no scroll on the screen-sized picture but instead lifts up a rising curtain of text (led off with a serif-font signature letter), you are reading a child of “Snow Fall.” The time that will elapse between today and the appearance of a properly exasperated send-up incorporating all of these technical elements can be measured in mere weeks, if not days. The genre’s presumption of importance fairly begs for satire. What Esquire demanded from Talese was a celebrity profile, one timed by Frank Sinatra’s camp to coincide with his upcoming special on NBC. 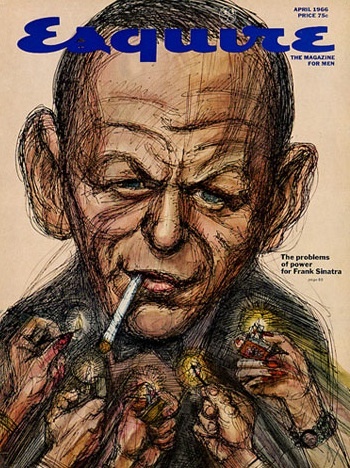 (“If you happen to be tired of kid singers wearing mops of hair thick enough to hide a crate of melons,” read the press release from Sinatra’s agency, “it should be refreshing, to consider the entertainment value of a video special titled Sinatra — A Man and His Music.“) It was characteristic of Sinatra’s sway in the industry that he could “grant” access to his staff — but refuse to sit down for an interview himself. The result was categorically implausible but no less legendary: “Frank Sinatra Has a Cold” is a 13,000-word celebrity profile whose subject refused to be interviewed. And, as Talese later acknowledged, it’s probably best that Sinatra was so aloof, because the piece foregrounds its subject all the more in the absence of direct quotation. Neither hostile nor fawning but measured, persistent and above all knowledgeable, Talese’s nicely modulated balance in tone was partly a happy accident, the product of a skilled writer doing an assignment he’d been ordered to do. Talese worked for weeks, and by his own count he interviewed over a hundred people, yet it’s manifest within every finely crafted sentence that the stakes in play here — capturing the biographical essentials of a celebrated singer with some degree of precision — are, after all, relatively low. Somehow bringing those two poles together qualifies as a small miracle, and the chances of miraculous occurrences were helped along when eager young Turks fresh from the Times like Talese and David Halberstam cranked out one of these every couple months. Everything about that culture — the magazines, the writers, the business model, the technology, and the readership — is gone. That’s not entirely to be lamented (for one thing barriers to entry in the longform writing marketplace have been lowered dramatically), but it does mean new work-arounds must be developed to approximate yesteryear’s triumphs. Even if longform isn’t an everyday occurrence, it could probably profit from us writing and editing and web-designing like it is. “Longform” is too capacious as an adjective, too rare as a journalistic endeavor, too impractical as a business model (it has always required cross-subsidy of one kind or another, even in the golden era), and far too grandiose as a set of web practices. But as a genre of writing it holds promise still, if it can survive its successes. This entry was posted in in many ways the work of a critic is easy on November 5, 2013 by johngasaway.